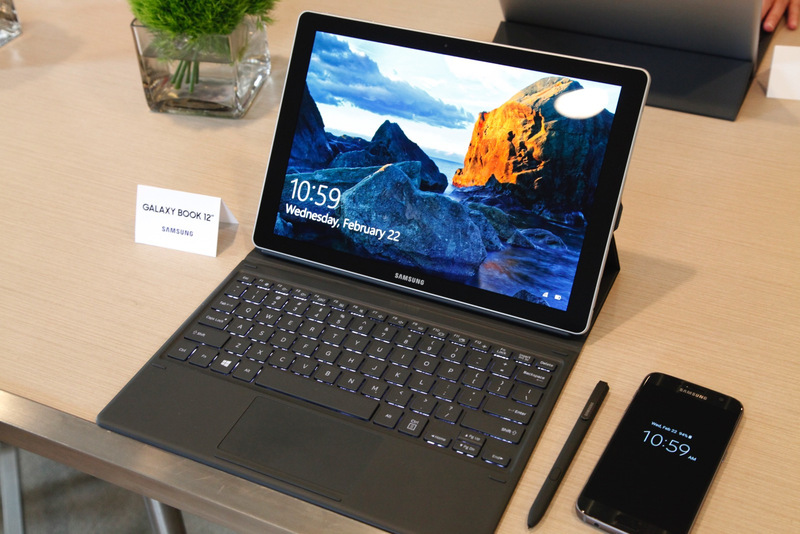 Microsoft is no longer the only game in town with a Book-branded hybrid as Samsung at Mobile World Congress this weekend unveiled its own take on the genre which it’s calling the Galaxy Book. The Galaxy Book will initially come in two flavors, a 12-inch model and a 10-incher. The larger model packs a 12-inch AMOLED HDR display operating at a resolution of 2,160 x 1,440 that’s powered by an Intel Kaby Lake i5 processor, up to 8GB of RAM and up to 256GB of solid-state storage in a chassis that measures just 7.4mm thick. It’ll also support the new S Pen (as will the smaller model) which offers 4,096 levels of pressure and a 0.7mm tip, includes a 39-watt hour battery that’s good for around 10 hours of usage between charges and the option for an LTE radio in addition to Wi-Fi. There’s also a 13-megapixel rear-facing camera and a 5-megapixel shooter up front. The smaller model, meanwhile, gets a standard 10.6-inch full HD LCD panel, an Intel Core M3 processor, 4GB of RAM and up to 128GB of eMMC storage. A single 5-megapixel camera handles video chat duties while the 30.4-watt hour battery is also good for 10 hours of uptime. Although smaller, the 10-inch version is a bit chunkier with a thickness of 8.9mm. Both machines run Windows 10, are expandable via microSD card slot and offer USB Type-C connectivity (one port on the smaller system, two on the 12-incher) and fast-charging features. The keyboard docks feature improved key travel and a larger trackpad, we’re told. Pricing and availability aren’t yet known.